Every backup operation in SQL Server is written to the SQL Server Error log. This includes Transaction Log Backups even when they occur as part of a Transaction Log Shipping Configuration. Sometimes logging the entire Log Backup can be a nuisance in the SQL Server Error Log and needs to be managed. Trace Flag 3226 is used to suppress such logging and we will demonstrate how this can be done in this article. In this article, let us review row-level and column-level tracking options in merge replication and how these are used in detecting conflicts during merge replication. Merge Replication: Merge replication is used to replicate data in both ways i.e. from the publisher to the subscriber and from the subscriber to the publisher. The initial snapshot of objects is taken and applied to subscribers. Incremental data changes and schema changes are tracked using triggers and applied to subscribers when the subscriber synchronizes with the publisher. Running DBCC Shrink commands is quite a controversial issue across the SQL Server community. In this article, we will review details about this command and provide a brief overview of its use and also warn you about the risks of running this command. As DBAs, a number of databases were handed over to from other teams or vendors, and it is not always we get to manage the databases which we created. As DBAs, whenever we are involved in migrations or new projects, we need to ensure that we carefully plan a smooth transition of the database to production and regular use. It is at this stage that we need to factor in the size of the database. Can you imagine, you set up a database application without considering the growth forecast for the first year or so. How about you create a SQL Server database with size so small that it needs to grow every other day raising capacity disk alerts in the middle of the night? It may sound silly, but in reality, the truth is this happens, and this sometimes may not be in your control. 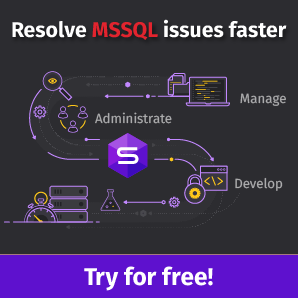 This article is about automating SQL database maintenance tasks through SQLCMD utility which lets you run T-SQL commands directly from the command prompt without using SSMS (SQL Server Management Studio). Typically, automating database tasks requires SSMS (SQL Server Management Studio) for scheduling jobs that run these tasks, but in this article, an alternative approach is used to automate database tasks without having to use the much-needed SSMS. The SQLCMD utility can be a real time saver for database developers and DBAs since they can immediately run the necessary SQL scripts from the command line, and automating database maintenance tasks with the SQLCMD utility is a plus. This is probably the most frequently-asked job interview question for database developers. In this article, we will try to answer it. Let’s start by looking at what primary and unique keys are, as well as at their similarities. The BCP (Bulk Copy Program) utility in SQL Server allows database administrators to import data into a table and export data from a table into a flat file. The BCP utility also supports various features that facilitate the process of exporting and importing of the bulk data. Regular database maintenance is an important part of a Database Administrator’s job which helps to ensure that critically important systems are running as per normal. One of the easiest ways to accomplish this will be to automate tasks related to DBCC CheckDB. No matter what version of SQL Server you are running, there will never be a database that requires no maintenance. You will have to plan the maintenance to occur regularly so that you can cover your back especially at the time of a real disaster scenario. In this article, we’ll look at some alternatives to using SQL cursors which can help to avoid performance issues caused by using cursors. Before discussing the alternatives, let’s review the general concept of SQL cursors. SQL cursors are primarily used where set-based operations are not applicable and you are required to access data and perform operations one row at a time rather than applying a single set-based operation to an entire object (such as a table or a set of tables). CRUD word is an acronym of the following essential database functions. In this article, we’ll look into the “APPLY” operator and its variations – CROSS APPLY and OUTER APPLY along with examples of how they can be used. how to identify performance issues by querying dynamic management views and dynamic management functions.